ConsumerDeals used to be a big fan of the Egg card mainly because at the time it offered one of the best deals around. After reviewing the card, the card's cashback rate reduced, and in September 2005, the cashback feature was removed altogether (except for a shopping on a handful of online retailers). The card still has some good points, and is worth considering, but it's a little less of a top card as it once was. For a look at some better deals on cashback cards, see our Credit Card section. One selling point is that Egg account holders can benefit from Egg's Money Management system - a website that allow you to access all of your online bank and credit card accounts from a single page. 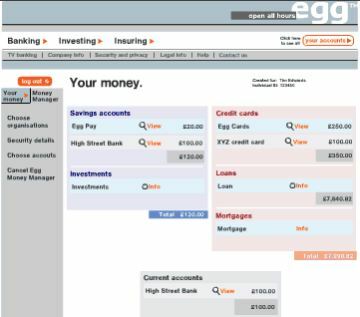 Best feature of any UK online operation we've seen, is Egg's Money Manager. This lets you consolidate all of your online bank accounts, savings and credit cards into just one login.